NIDA. "Teacher's Guide." National Institute on Drug Abuse, 1 May. 2005, https://www.drugabuse.gov/publications/mind-over-matter/teachers-guide. NIDA. Teacher's Guide. National Institute on Drug Abuse website. 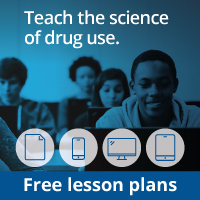 https://www.drugabuse.gov/publications/mind-over-matter/teachers-guide. May 1, 2005.